In case you haven’t noticed yet, I love making dips! Specifically, I love making dips from beans; they’re just such a great base! They’re healthy and a great source of fiber and protein. And white beans, such as northern or cannellini or navy beans, are so mild that they are quite versatile in dip-making; you can pair them with so many different flavors. 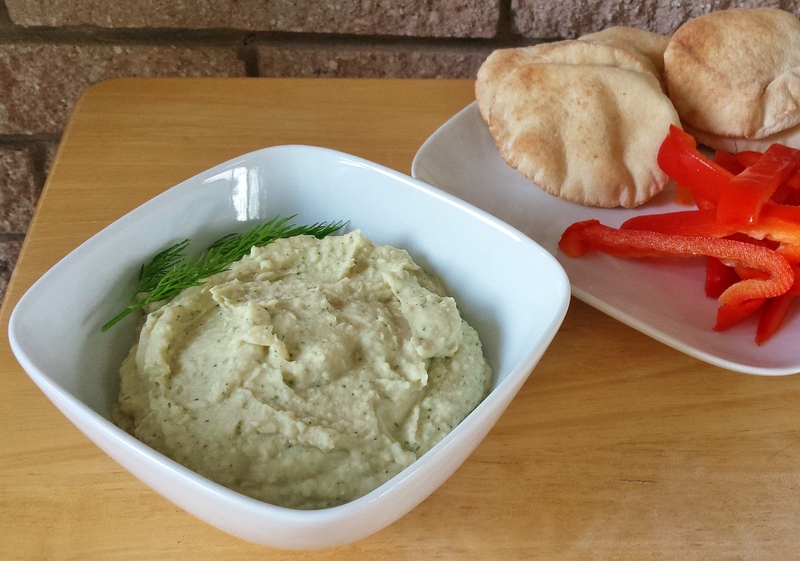 Northern beans were the perfect backdropfor this lemon dill dip. The bright citrus flavor of the lemon and the coriander and the lovely tang of the fresh dill are the front-and-center-flavors, as they should be! As you can see in the photo above, I paired this dip with my usual just-can’t-give-’em-up white pita rounds as well as some red bell pepper slices. I have to say, this is probably the first time that I preferred a veggie over a carb with a dip. What a revelation! I usually (begrudgingly) eat dips such as hummus with celery or carrot sticks when I’m trying to be healthy. But the bell pepper slices were just perfect here, possessing the optimal amount of crunch and flavor but still light enough so that the focus was on the dip. I truly felt like I was eating a treat rather than a healthy necessity thinly veiled as a treat! In fact, I actually found myself gobbling the red pepper slices faster than the pita bread – certainly a first! If you’re going to use dried beans as I did, then you’ll need to soak them, covered by a few inches of water, in a bowl overnight, or for at least eight hours. Drain and rinse the beans once soaked, then add them to a pot with several inches of water covering them and boil at a gently rolling simmer for one hour. Drain and rinse them again and let them cool at least a bit before adding to the food processor (the dip tastes best chilled, so you could let them sit for a while in the fridge after cooking). Add all ingredients to a blender or food processor and mix until well-blended (it can take several minutes to achieve a really smooth, creamy texture). Enjoy with your favorite chopped vegetables, dipping breads, or crackers.